Twinkling lights illuminated Detroit Avenue, fireworks popped in the early December sky under a full moon and an aura of merriment filled the city’s downtown district. 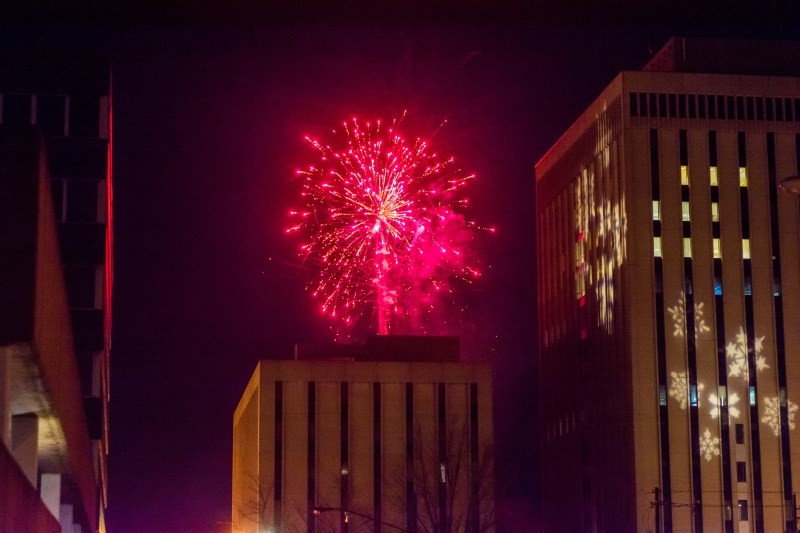 The holiday season is now officially underway in Lakewood. 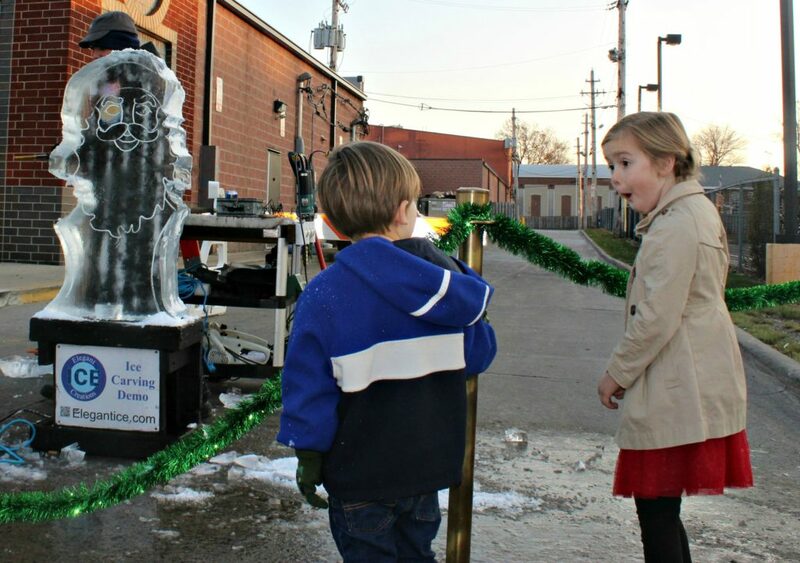 Children enjoy an ice sculpture carving demonstration. 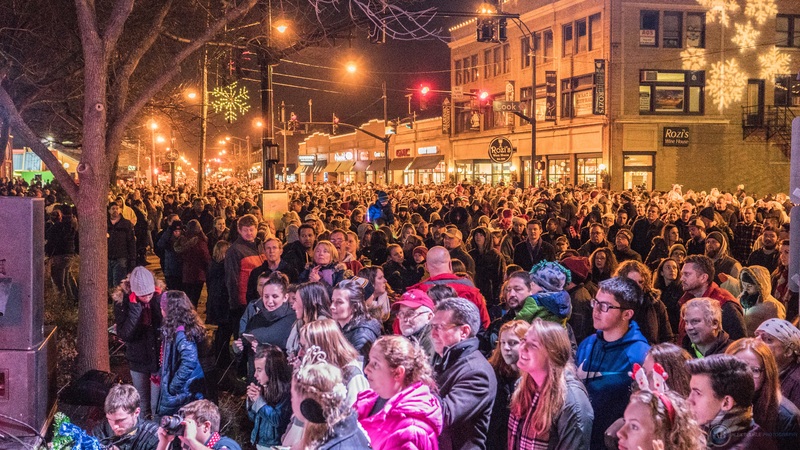 People from across the region descended upon Downtown Lakewood in droves on Saturday, December 2, to partake in the holiday tradition that is Light Up Lakewood. A festive crowd estimated at 20,000 attendees enjoyed LakewoodAlive’s 11th annual holiday community event celebrating the spirit of the season and the richness of the city’s vibrancy. Sponsored by First Federal Lakewood, Light Up Lakewood 2017 kicked off with Lunch with Santa at Dewey’s Pizza followed by joyous musical performances at Lakewood Baptist Church. 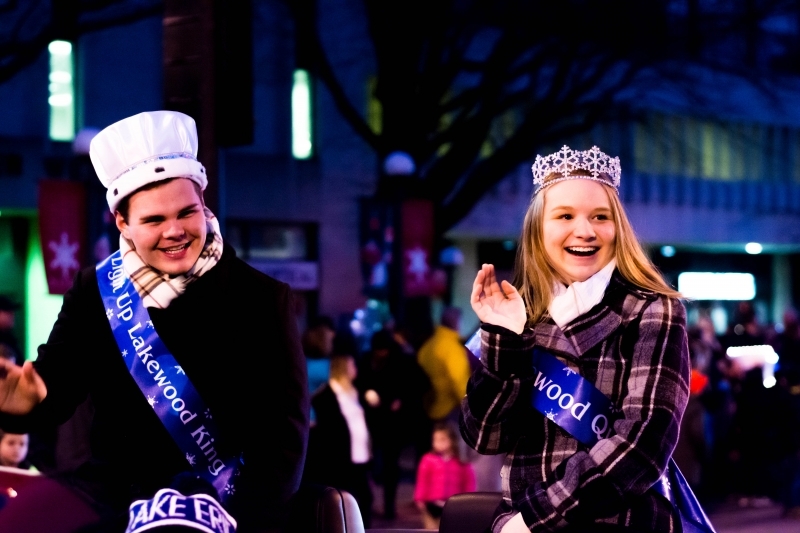 The festivities then shifted to Plantation Home, where Lakewood High School juniors Erin Black and Greg Medley were honored as Queen and King of Light Up Lakewood. Erin and Greg were both awarded $500 scholarships from owner David Stein in recognition of their outstanding service to the community. 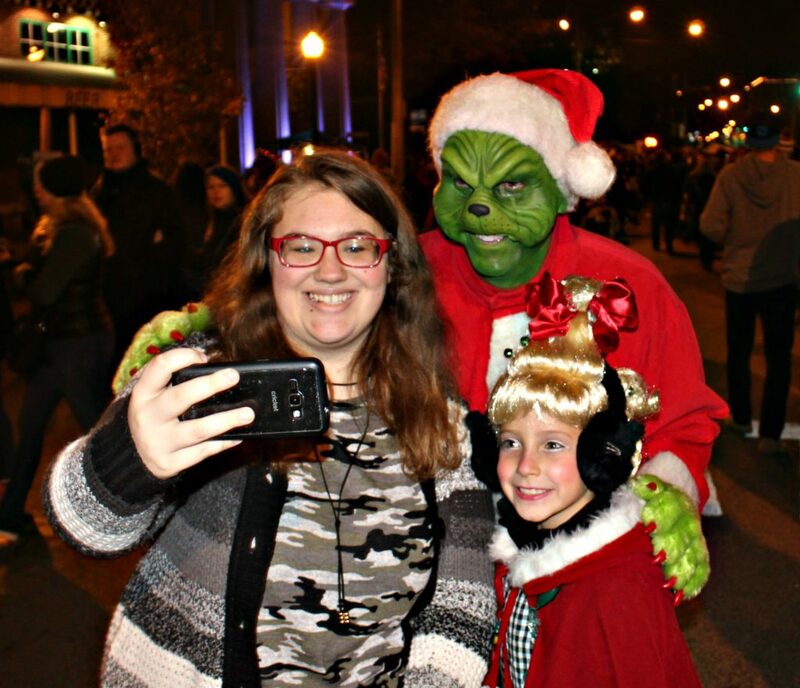 Thankfully, The Grinch is not a mean one at Light Up Lakewood. The doors to Vendor Village at the historic Lakewood Masonic Temple opened at 4 p.m. and the Holiday Parade stepped off west-bound along Detroit Avenue one hour later. First Federal Lakewood President & CEO Tom Fraser and Board Chair W. Charles (Chas) Geiger III served as Grand Marshals of the parade. Crowd-pleasers Buddy The Elf and The Grinch highlighted the popular Holiday Parade, which included participants ranging from student organizations to huskies to, of course, Santa. Festival-goers lined both sides of Detroit Avenue taking in the sights and sounds of the parade, which featured 30 participating groups. The Lighting Ceremony commenced at Lakewood City Center Park with remarks from Mayor Michael Summers and with Poet Laureate Bill Knittel reciting his latest Light Up Lakewood poem entitled “All Along.” After a crowning ceremony for Erin and Greg, Kirsten Loyd – a fourth grader who won the Lakewood Chamber of Commerce’s “Why I Love Lakewood” essay contest – read her piece, and the Peddlers of Mirth performed holiday carols for the delighted crowd. Buddy, Santa and his elf joined Kirsten to flip the big red switch and illuminate City Center Park before fireworks sparkled over the rooftops of Downtown Lakewood to culminate the festive celebration. The free, family-friendly community event also included musical performances at Lakewood Public Library, live music courtesy of The Sellouts, outdoor carolers and musicians, DJs, ice carvings, free hot chocolate, food trucks and children’s games.